Harvard researchers have been working on their robot bee for a really, really long time (in robot years). It’s impressively small, being bee-sized, but it turns out that it’s so small that it’s not realistic to expect it to fly with onboard power and computing in the near future. Plus, the flight dynamics of tiny insects like bees is significantly different from larger insects like butterflies and moths, which exhibit combinations of flapping, gliding, and soaring flight. 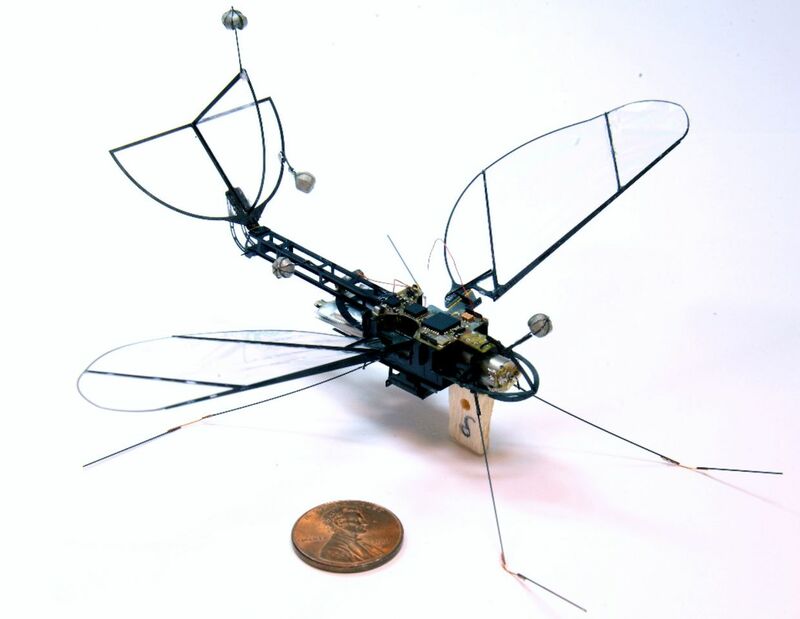 To explore this, Harvard researchers have developed FWMAV, a novel insect-scale flapping-wing micro-air vehicle that’s just small enough to be called “micro” and just big enough to operate completely untethered. The video makes it look like FWMAV has some trouble staying aloft, but the researchers told us that it can keep a stable altitude by flapping between 70 percent and 80 percent of the time. The wings are delicate, though, and when this particular clip was filmed (after 30 or 40 flight tests), the robot was a little bit beat up and wasn’t at peak efficiency. FWMAV has a wingspan of 16 centimeters, and weighs just over 3 grams (almost half of which is the motor). It’s fully untethered, with onboard power, communication, and control systems. In overall dimensions and performance, it’s analogous to the tobacco hawkmoth. Flapping at 25 Hz, it can average about 4 g of thrust, more than enough to keep it airborne. The flapping action itself is generated by a folded carbon fiber transmission that converts the rotary motion of the motor into up and down motion of the wings, which are designed to flex over a 90 degree range to vary their angle of attack and improve aerodynamics in the same way that real insect wings do. A 3D model of the robot used for simulation. The most obvious departure from the bioinspired design is in the tail, which is far more airplane-like than moth-like and required to keep the robot stable in yaw and roll. Real moths can do this using independent control of each of their wings, but since FWMAV doesn’t have this capability (yet), the tail is necessary. It also can’t take off by itself, and needs to be launched by catapult. Relative to RoboBee, which can take off and hover and steer (and was learning to swim), FWMAV might seem a little primitive, but this paper represents just the first hardware validation. Researchers are already planning aerodynamic improvements, tail actuation, and a redesign to allow independent control over each wing. They’re also looking forward to taking the robot outside of the motion capture area that it’s currently restricted to, with the goal of closed-loop flight in bigger, more open areas. “Development of a 3.2g Untethered Flapping-Wing Platform for Flight Energetics and Control Experiments,” by Michelle H. Rosen, Geoffroy le Pivain, Ranjana Sahai, Noah T. Jafferis, and Robert J. Wood from the Harvard Microrobotics Laboratory, was presented this week at ICRA 2016 in Stockholm, Sweden.